Surrounded by misty hills and green fields lies this beautiful temple of lord Vishnu. The idol of Ranganatha is 4.5 feet in length with Bhoo Devi and Neela Devi at His feet. Lord is in Yoga Nidra and his Shesha (Lord Vishnus Snake) is spreading his hood like an umbrella. The idol is beautifully sculpted out of Black Saligrama stone and it is believed that the sanctum sanctorum was installed by the Sapta Rishis. Locals state that if devotees visit this temple after Adi Ranga in Srirangapatna, Madhya Ranga in Shimsha and Anta Ranga in Srirangam, they achieve liberation or moksha. Hence the Lord is known as Moksha Ranganatha. We were lucky to witness the elaborate “Abhishekam” of the Lord in Milk, Curd, Sandal etc with the divine chanting of mantras. A rare sight and the priests had no objections to photography and video. And guess what – we were the only people in the temple seated right next to the sanctum sanctorum. On the wall there are sculptures of Saptarishis, Brahma, Rambha, Urvashi etc. It feels like the Lord is in Vaikunta and he is surrounded by all the gods who are prostrating in front of him. The temple is serene and peaceful and its a joy to sit quietly and soak in the energy and vibrations exuding from its premises. On a weekday its empty. The architecture of the temple is very “Chola” with the intricately sculptured pillars that support the temple. It is very well maintained and clean. Adjacent to the temple is a large step well. That is currently not operational. But one can visualise how beautiful it would have been when it was brimming with water. We left temple at 11.15 AM and reached our lunch place at Race Course Road – South Ruchis Square exactly at 1 PM. This is a newly opened pure veg restaurant that serves Breakfast, Lunch and Dinner. I would call this Bangalore’s nicest fine dining S Indian restaurant. Nice interiors, good service and most importantly the food was sumptuous. You have a choice of a regular S Indian Thali or Millet Thali. Lots and lots of varieties in the Thali. And guess what, its priced at a very affordable Rs 180/-. This was the second great find of the day. Drive Time from Koramangla Via Devanahalli Airport ~ 2 Hrs. Breakfast stop – Udupi Swaada. Nice place with clean bathrooms. Lots of restaurants on this stretch. 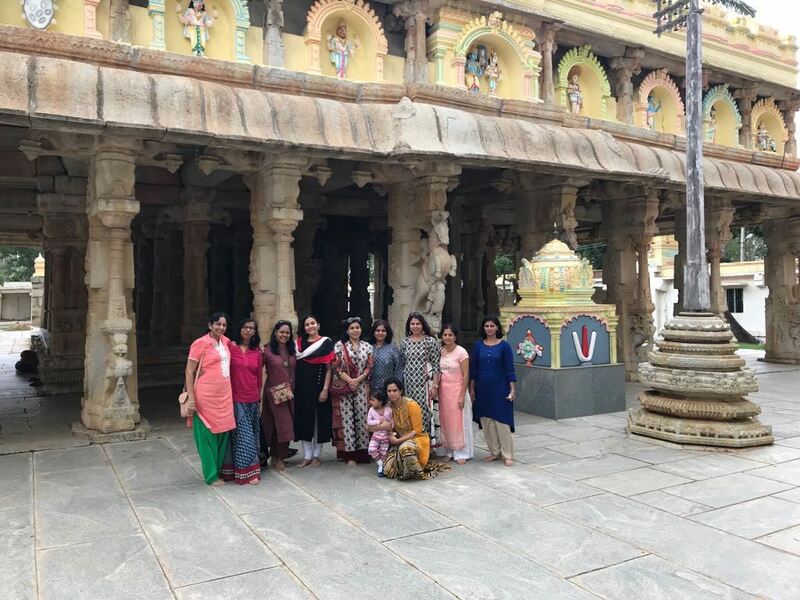 We left Koramangla at 7.30 AM and reached our breakfast halt (10 Km after the airport) at 8.45 AM and after a leisurely tasty breakfast were at the temple at 9.45 AM. The last 15 Km are thru the town of Chikkaballapur, roads are good – last 1 Km is mud road. Google maps gets you to the temple correctly. Budget 60 – 90 Minutes at the temple. On the way back if you have time you can stop at the Devanahalli fort where Tipu Sultan was born. You can see it as your drive on the highway. Inside the fort there is another Vishnu temple. We had a 3.30 PM return deadline so could not cover this. Back home at Koramangla 2.15 PM.